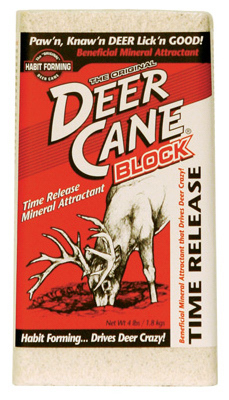 Deer co-Cain is a beneficial mineral supplement that attracts deer by releasing a mineral vapor trail. After initial application, moisture will cause these minerals to keep reacting and attracting deer. Bucks seeking minerals for overall health and rack development will be drawn to the site to lick, paw, mark and consume the minerals. Bucks will want to protect the Deer co-Cain site by rubbing, scraping and rolling in the mineral site to mark it as their own. The buck's action will naturally lead to the attraction of more deer. Over time, a large deer wallow will be created as many deer develop the habit of frequenting the site to consume the beneficial minerals. Place one or two blocks in an established Deer co-Cain or other mineral site to provide months of attraction without having to return to the site. To establish a new site, place one or two blocks in the middle of a bare spot, 4' in diameter. Rainfall will be needed to activate the site, allowing the minerals to fully leach into the ground. For Instant Results... Use in combination with Deer co-Cain Mix or Deer co-Cain Liquid.